Would you like extra support for your pet when they are unwell or navigating old age? Would you like some extra support for yourself, as you face those challenging times? Ferris Jay is an Energy Therapist, EFT practitioner and coach who has been working in the holistic health field for 16 years. 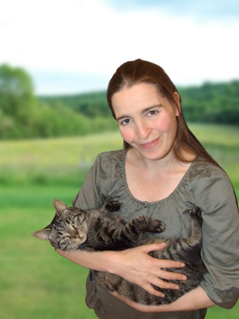 She is a passionate up-lifter, helping both people and pets worldwide to thrive and to overcome adversity. Ferris helps pets to overcome illness, injury, pain and discomfort using natural, non-invasive techniques that complement veterinary care. She helps pets to improve their quality of life, vitality and happiness. She empowers their people to be active participants in their pet’s healing process and shows them how to avoid the stress, upset and confusion that can arise when care giving for their pet. Ferris specializes in helping pets to navigate old age with grace and ease and helping their people to come to terms with their pet’s mortality, helping them enjoy every moment together and cherish their precious memories. She also offers pet bereavement support for those struggling to cope with the death of a pet, helping them come to terms with their loss, heal their hearts and move forward whilst honoring their pet’s memory. For more information about her pet healing, pet parent coaching and pet bereavement support services please visit her website where you can download her free video series showing you how to use EFT tapping to help your pet to heal.